I am a huge fan of meals in which I can make parts of it ahead of time and then just throw it together after we get home on busy weeknights. This salad sounds wonderful. Your backyard garden is beautiful and so is the salad! 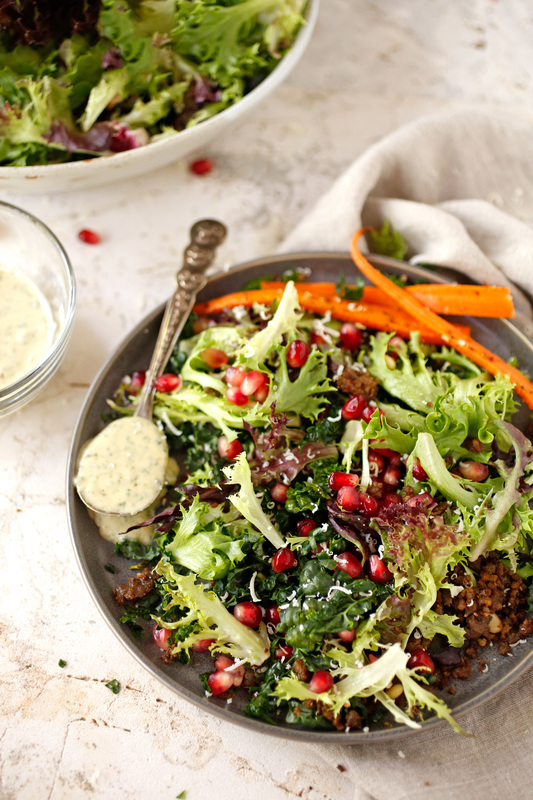 I love all the different leafy greens and the dressing sounds amazing. 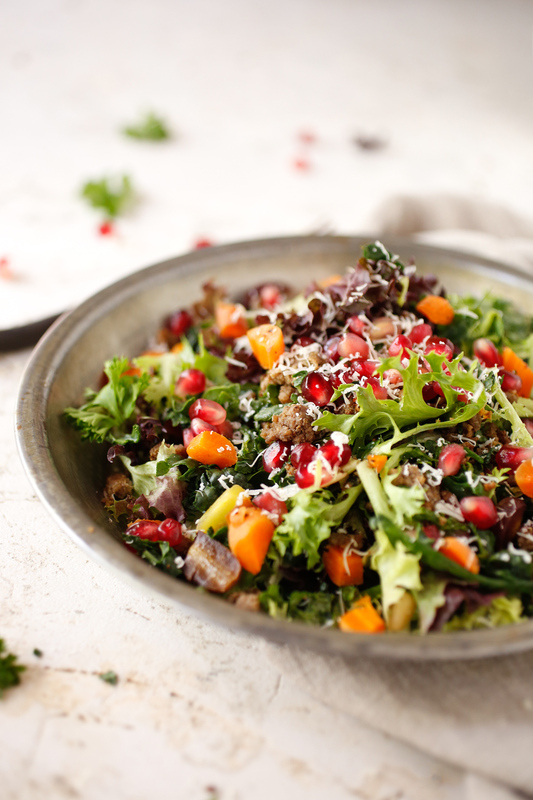 The pomegranate seeds and pine nuts – oh, yeah! Yum! The salad looks so delicious and adding meat makes it a complete meal for the guys in the family. Like how you used kale in the salad. 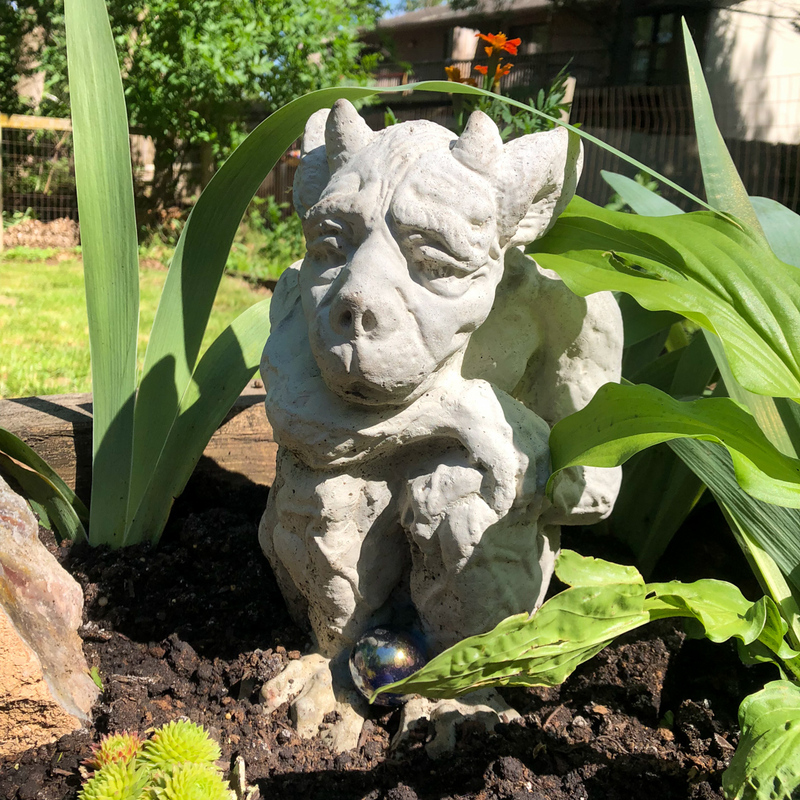 Your garden looks fabulous. I wish I could grow stuff but alas, I have a black thumb. This looks like my kind of salad. I could have this and then eat a cookie and not feel so guilty. This recipe looks so yummy. Your garden is beautiful. Hoping I have a great harvest this year to make some yummy salads as well. Your Moroccan salad looks delicious and so picture perfect. I am unsure about lamb. I have not eaten lamb much so I would be tentative on that here. But the rest of it looks incredible and healthy too. Love new salad ideas in the summer months. They are vital to keep meals fresh and interesting. What a colourful and vibrant salad that’s good beautiful. Great colours and flavours too. I’m not a fan of salads, unless they are loaded to the brim with flavors. 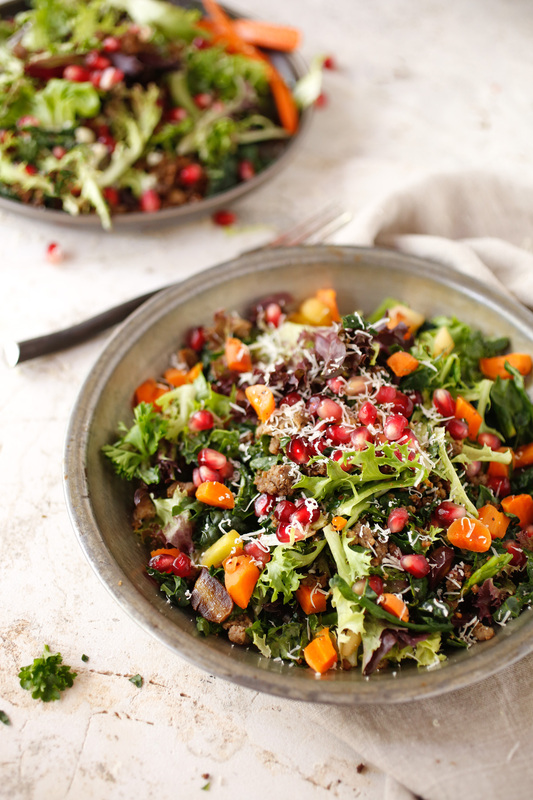 You have done that with this tasty lamb and kale salad, with those yummy moroccan flavors. This salad looks tasty. I’ve never had lamb in salad before. I am SO jealous of your garden! I kill everything I try to grow! I would love to go out in my garden and just pick veggies to eat! It sound like you are at the beginning of a great summer! Gahhhh I wish my garden had more! This recipe is deliciousl! Lamb and Kale are two of my favorite ingredients. Sounds like you have a nice amount of fresh veg growing in your garden. I have gooseberries growing at the moment – I’m very pleased with myself. I have been showing my friends that salads can be yummy for years and this one really does prove my point. I wonder if I can make it as well as you have. Looks fantastic! I would happily serve this to my family and friends. I enjoy a good salad in the summer, when veggies are at their peak. Gosh your yard is something amazing! This salad looks like something from a gourmet restaurant! 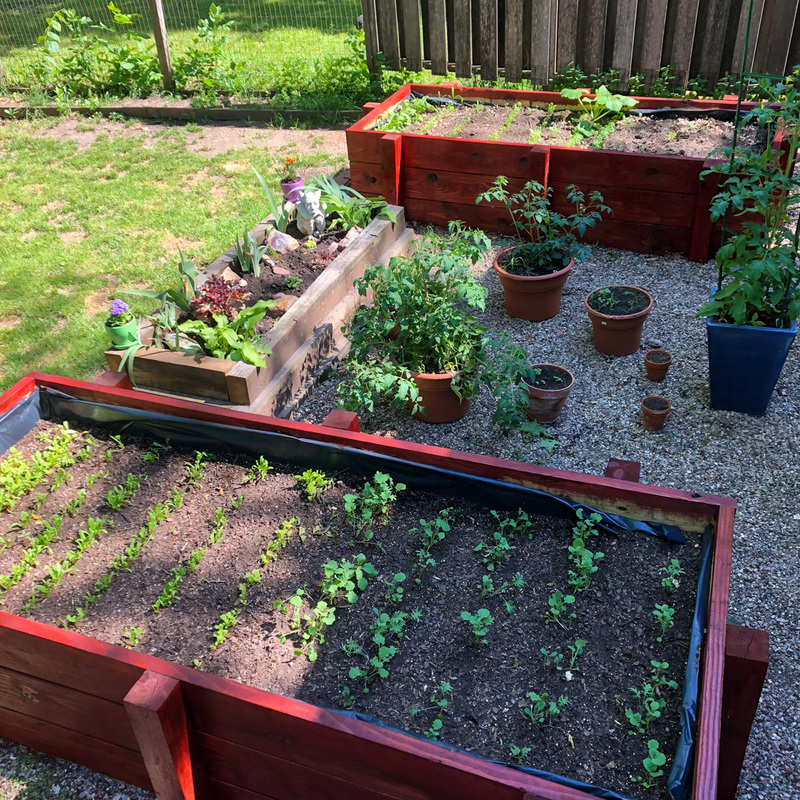 My dream is to have a backyard garden (raised beds and all) just like the one you have! And that salad looks amazing. Would not have thought to try lamb with a salad. I bet it tastes soo good. 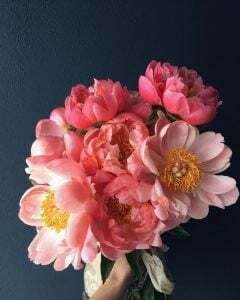 I would love to have a friend that’ll just hand me a bunchful of peonies, just like that! Also, how is it growing kale? I am tempted to try but am afraid it’ll be hard! The freshness of this salad is next level. I need to try this one out! Are all those ingredients freshly taken from your amazing backyard?!?! I have started to fill my terrace with fresh basil, mint, and pepper and I can’t wait to cook all my beloved vegetables and pasta with them!! (yes, in Italy we hardly have backyards when we live in cities but in the south, where I live, we often have terraces). Your garden looks great. My beets isn’t doing so well, it’s my first time trying to grow it. That salad looks so good! This salad really good! I normally don’t like salad without Mayo but I would definitely eat this. Been wanting to have a mini garden in my backyard but my place could not accommodate such. Hopefully I can try gardening even some plants that I can also use to when I am cooking. Would just put it into small pots to grow. I am a pescetarian so I’d skip the lamb, but wow, that salad looks delicious! I love colorful foods and that definitely checks all the boxes. What a beautiful and vibrant looking salad. I love kale in a salad to change things up and the addition of lamb would make my husband happy too. It sounds like your garden is really taking off all those different veggies you have planted YUM! This salad sounds delicious as well I LOVE kale! Oh wow your garden is beautiful! I am very jealous, I’d love to grow my own vegetables! The salad looks delicious and way more my kind of meal with the lamb in there too! That is one extraordinary looking salad! All my favourite flavours wrapped up in one bowl. Who knew kale could look so good! Love your garden!!! Love the colors you have incorporated in it. This salad looks exactly what I would fix. Thanks for sharing. Moroccan flavours are some of the best I think and lamb and pomegranate is just perfection! YUM! I love lamb and I love salads and am definitely going to give it a try this summer. Thank you for the recipe! Look at your garden! So full of life, it’s so exciting when the veggies start to pop through the soil. I’m also loving the newness of summer. It’s making me feel like a whole new person. Salad looks gorgeous! My neighbor is growing kale this year and planted extra just for me. I cant wait until I have fresh kale. I love lamb, always have it every Sunday and I am happy to be able to try this. Looks so delicious and the colours are amazing. I love that quote about being young and feeling like you can make a difference. It reminds me of when I was in college. I got really into environmental activism and fell into a group of friends who were really into it to (naturally since we were all involved in the same organizations). We went up to DC for protests and did stuff on campus. I’m definitely still concerned about those same issues, just a bit less idealistic than I was then. But that time is great because you have lots of energy and the real world hasn’t quite hit you yet. This salad is so pretty and colorful! I’ve never had lamb and pomegranates in a salad before. Looks tasty! Your backyard is just too cute; fresh produce right from the farm speak of an absolutely awesome lifestyle. Anyway, today’s recipe looks as yummy, colorful and enticing. Check out the Zuni Cookbook and its fantastic salads. They are truly quite awesome. My husband and I often enjoy a simple salad of rocket (or dandelion greens), oranges, dates, and prosciutto, maybe some toasted almonds as well. 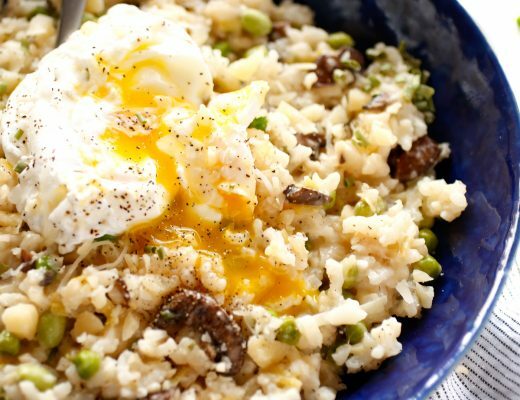 It makes for an easy and flavorful meal indeed! this salad literally has all of my favorite ingredients. i love lamb and during the summer tend to grill it more but this is a great idea on using ground lamb. love it. What a lovely garden you have, it’s nice to see how well it is coming on! The Moroccan lamb salad seems like the perfect meal for a summers day, I could veto the meat and still really enjoy this. I love anything that is easy to put together like this. i just got back from a trip in Morocco and i love their food! and how timely i came across this as i was actually looking for recipes! so excited to try this! This looks so delicious. And I love kale. I need more salads that are fresh and healthy to make. Such a great suggestion! 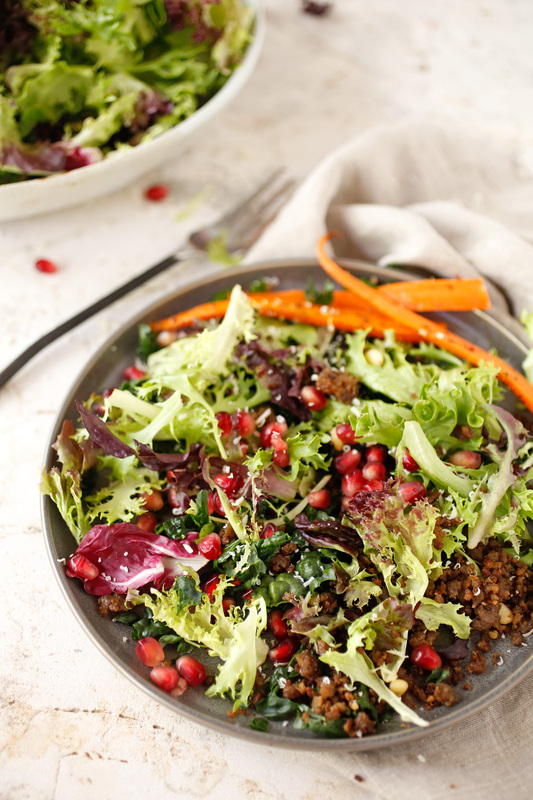 Honestly, this salad looks out of this world – like all the meals you feature on the blog ! Hummus with cucumber and feta cheese is my favourite summer obsession. This looks like a delicious salad to enjoy. I’ve never had lamb before but I hear it’s delicious! Love this salad so much! It’s so colorful and beautiful and I love that there’s lamb in it! Yum! This looks like the perfect summa salad. I love all of the flavours. I would be excited too if I had the pleasure to do a little garden like yours! 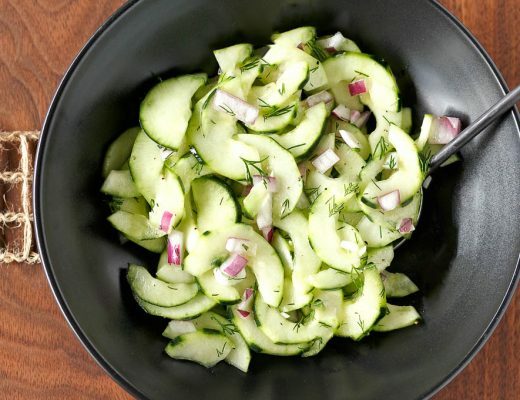 This salad is the perfect choice for summer! Your garden looks beautiful. Watching plants grow makes me so happy. We’ve moved, and I miss my little garden so much. I hope I can carve out a little corner in our new yard soon. I wish I could grow a vegetable garden too. But I have such limited space that I can only grow herbs in small planters. Your salad looks really delicious! My husband has been asking me to make salads more often. I will add your recipe to my list. I really need to try Lamb again… I stopped eating it because it was the last thing I ate before the day I had emergency stomach surgery – so I associate it with that but I know it wasn’t the cause! Ha! 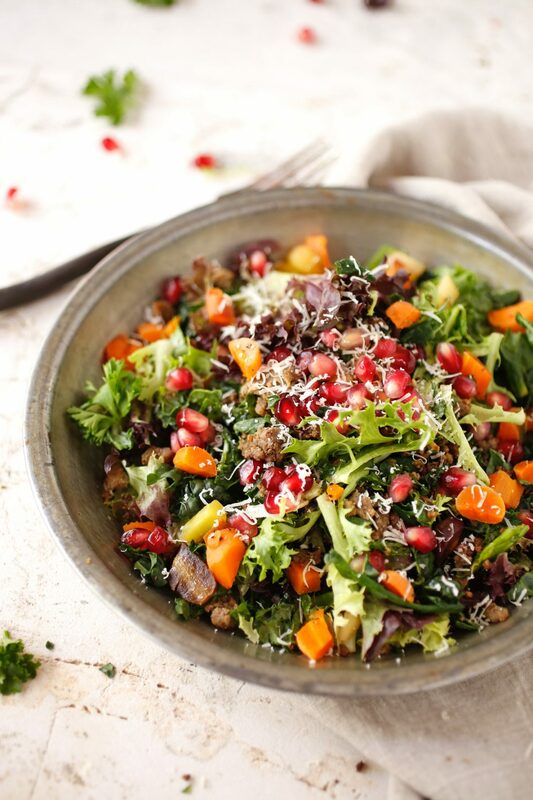 I would definitely love to try this kale salad, especially since kale is full of so many nutrients and antioxidants. Oh and in terms of my favorite smell, it has to be a tie between the smell of freshly baked bread and the aroma of a curry, they are both intoxicating scents to me. And naturally because I am always hungry, of course a food scent would be my favourite wouldn’t it? Beautiful post, that salad look delicious! I will attempt it but without pine nuts! And I agree about the comment regarding change it does not have to be scary but can actually be really liberating and necessary! Thanks for sharing. I love the recipe here. I am a huge fan of any dish with some lamb in it. Your back garden is lovely. I wish my garden was as interesting. This post captures the essence of early summer perfectly. I have a similar favorite summer scent, but mine is campfires 🙂 Also, I love kale salad so I really want to try this recipe!